RMNB’s new “Hahaha Ice” T-Shirts can be purchased here. While we dedicate a lot of our time to RMNB, our team slaves away at full-time jobs just like you. Peter is an information architect, I’m a web designer/email marketer, and Fedor is a full-time student in Moscow and a journalist for VOA. Then there’s Igor. Four score and seven years ago… okay, maybe not that long – but long enough that Scott Stevens was still a Capital and the Soviet Union was still a thing, Igor– fresh out of college– left St. Petersburg and the crumbling empire for America. Within a couple of months after getting off the proverbial boat, Igor landed his first job: an engineering position at the NASA Goddard Space Flight Center. Over 22 years at Goddard, Igor has worked on some pretty important space missions. He worked on a science instrument for the Spitzer Space Telescope, an orbiter similar to Hubble which takes infrared photos of the universe. He also was part of the design team for the Lunar Reconnaissance Orbiter, a satellite that collects data of the moon. And two Fridays ago, one of Igor’s projects got global attention for a finding many thought was impossible decades ago. Despite being our solar system’s innermost planet, Mercury’s poles are cold (like your feelings towards Sidney Crosby) because they never tilt towards the sun. Mercury’s thin atmosphere also can’t contain or insulate heat. Evidence for deposits of ice at both poles has been building since the early 1990s, when radar studies first spotted areas that looked very bright at radar wavelengths. These bright regions suggested something reflective lay on top of or very near the surface of the planet’s poles. 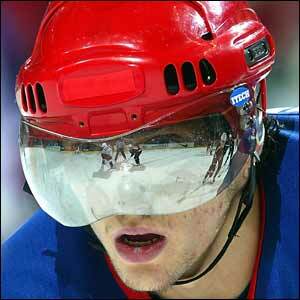 Could it really be ice or maybe a box of Alex Ovechkin’s old face-shields? NASA set out to answer the question. In 2002, the Mercury MESSENGER mission began. Before the orbiter was launched, a handful of scientific instruments needed to be created and built into the satellite: a fancy camera, a couple of spectrometers, a magnetometer, a radar, and a laser altimeter. The altimeter (MLA stands for Mercury Laser Altimeter) is the instrument that Goddard was asked to build. Igor and one of his colleagues of 20 years were given the assignment. In addition, what NASA would be looking for once MESSENGER reached Mercury were nice, sharp, and strong pulses back. That meant they hit something very reflective, like a mirror, or in the case of Mercury, where it is very unlikely there are any mirrors, an ice patch! So Igor and his colleague designed, built, tested, and delivered that fancy stopwatch (officially known as the Range Measurement Unit) to Messenger 10 years ago (seen below). On August 3, 2004, the 1,070 pound spacecraft was launched from Cape Canaveral, Florida, aboard a Delta II rocket. The spacecraft flew by Earth once and Venus twice before reaching Mercury in January of 2008. After three fly-by’s, taking three years to accomplish, MESSENGER successfully entered Mercury’s orbit on March 18, 2011. It sent its first photo back to earth 11 days later. 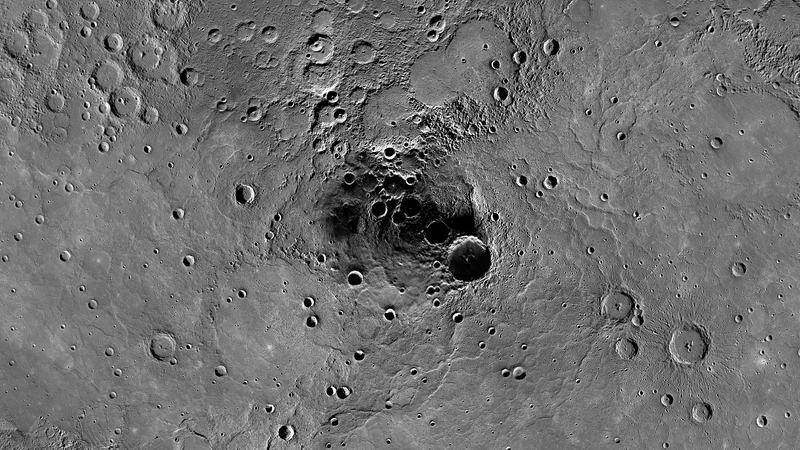 After a year of MESSENGER collecting and transmitting photos, maps, and data of Mercury back to Earth, NASA discovered ice on the planet’s north pole on November 30th. Igor’s fancy space stopwatch, which he described as one of the hardest things he’s ever built at NASA, was a success. This might explain why that day, when I noticed a Russian language interview of Nicklas Backstrom ripe to be translated, Igor unexpectedly declined. “I just had a few beers in my meetings. I’ll explain later,” he said. The Backstrom translation never happened, because in the words of Alex Ovechkin,”hahahaha ice.” Congratulations, Igor. The Range Measurement Unit Igor helped build.